YEEEY – spring has finally arrived! The thermometer is rising, birds are singing & tweeting and many new things are happening in our kitchen lately. From now on we are keen on fresh & light dishes with lots & lots of herbs. Herbs are one of the most important ingredients when it comes to cooking, which should never be missed. They give any meal their own special flavor, for example, you can change the flavor of a dish completely by only replacing the herbs. Convenient, right?! We prefer Wild Garlic, Mint, Chives, Cilantro & Dill on our plates in spring. Here are 5 yummy recipes with our most beloved herbs. Cheers to the freshness! Peel sweet potatoes, cube, and cook in salted water for about 10 min. In the meantime, wash and drain lettuce. Wash cilantro, shake dry, and chop. Wash lime thoroughly and zest the peel. Mix mayo with cilantro and lime zest, and set aside. Peel and grate garlic and ginger. Drain sweet potatoes and mash into a puree. Add breadcrumbs, garlic, and ginger. Season with coriander, allspice, curry, and salt. Mix everything well. Mix coconut flakes with chili flakes and put on a plate. Form patties with wet hands and toss in coconut-chili mixture. Heat oil in a pan over medium heat and fry patties for about 2 min. Carefully turn and fry from the other side for about 2 min. Halve avocado, de-seed, and cut flesh into slices. Halve buns. Brush one side with cilantro mayo and the other with mustard. 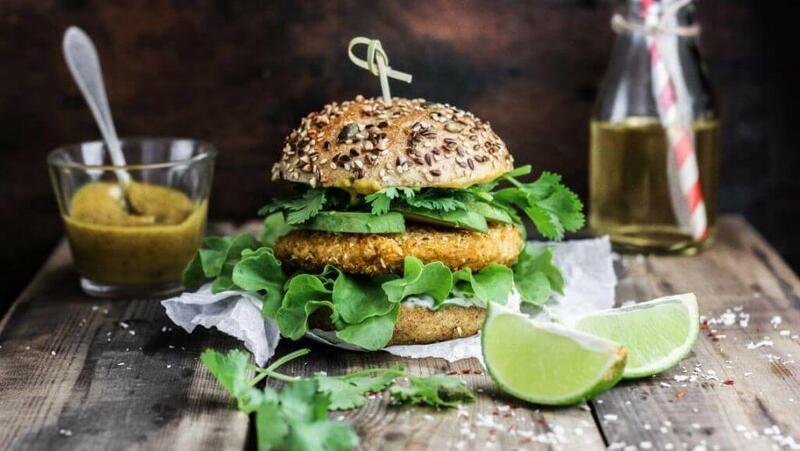 Top with lettuce, patty, and avocado, and enjoy. Clean asparagus and cut off tips. Cut off ends, peel asparagus and cut into 1/2″ long pieces. Peel turnip and cut into cubes. Wash, drain and chop bear leek. Wash green onions and cut into thin rings. Separate green and white parts. Heat butter in a pot and lightly braise white parts of green onions. After a few minutes, add rice and lightly sautée it. Deglaze with white wine afterwards. Pour in broth bit by bit while constantly stirring. Meanwhile, sear asparagus tips with butter in a pan and put aside. Lightly braise turnip and asparagus pieces with butter in another pan. After a few minutes, add some water and stew for around 10 min. Season to taste with salt, pepper and sugar. 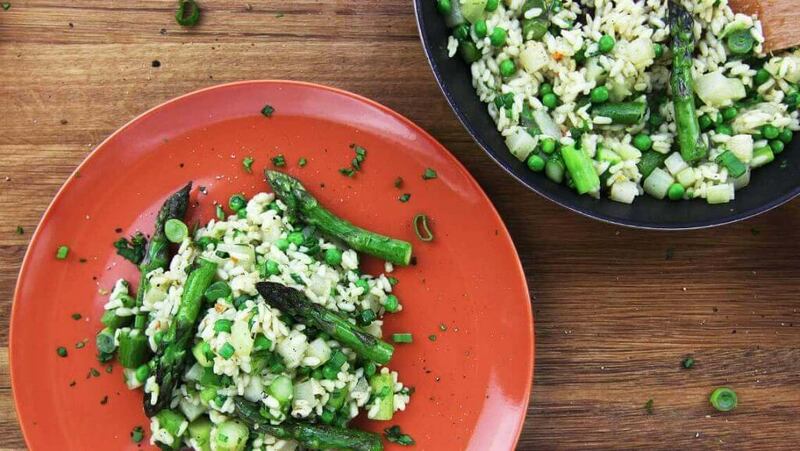 When rice has the right consistency, add turnip, asparagus, peas, green onions and bear leek. Heat everything up, season to taste with salt, pepper and sugar if necessary and serve hot. Toast pistachios in a pan without oil for 3-4 min. Halve lime and squeeze out juice. For the pesto, blend pistacchios and mint. Add oil and honey and blend again, until pesto is evenly creamy. 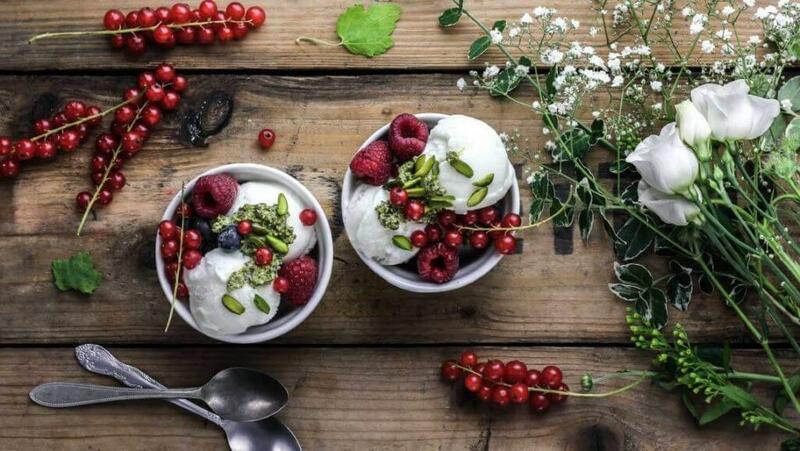 Place frozen yogurt and berries in a bowl and serve with pistachio-mint pesto. In a pan without oil roast almonds until golden brown. Wash fennel, remove the stalks, cut fennel bulb in half and remove the core. Thinly slice fennel. Mix fennel with a pinch of salt, using your hands. Halve orange and squeeze out juice. Halve pear and remove core. Thinly slice pear and drizzle with a little orange juice. Whisk vinegar, the remaining orange juice, honey, and olive oil together. Season with salt and pepper. Wash and thinly slice celery. 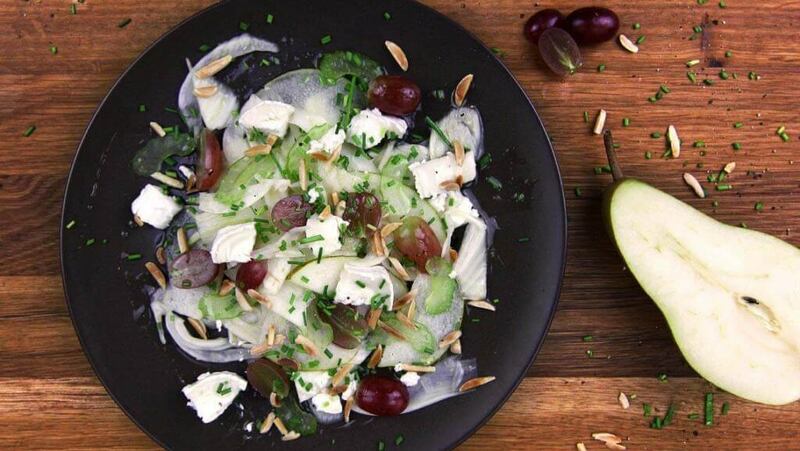 Arrange fennel, celery, pears and grapes on a plate and drizzle with dressing. Top with almonds, chives and goat cheese. Wash sweet potatoes, peel, dice, and cook in salt water for about 15 min. Heat oliv oil in a pan and sauté spinach briefly until it shrinks. Wash, drain, and chop dill. For the mustard-dill sauce, mix sweet mustard, spicy mustard, dill, agave syrup, and sunflower oil. Season with salt and pepper. 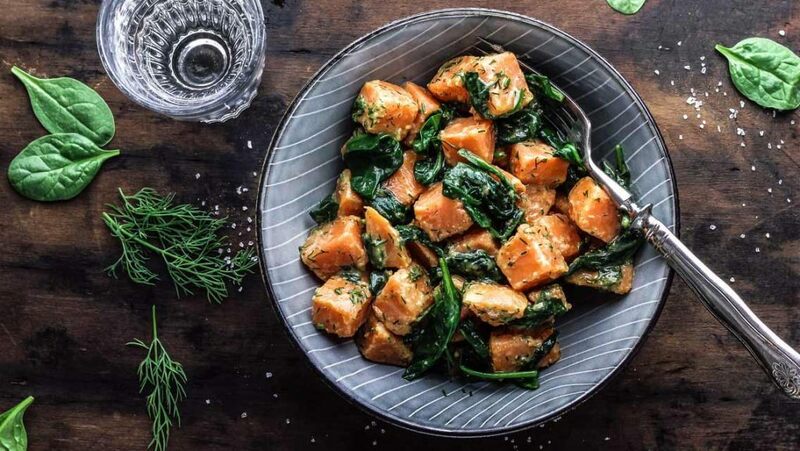 Mix boiled sweet potatoes and spinach with the mustard-dill sauce and enjoy. Posted in Rezepte and tagged Frühling, Kräuter, Minze, rezept, Schnittlauch. Bookmark the permalink.